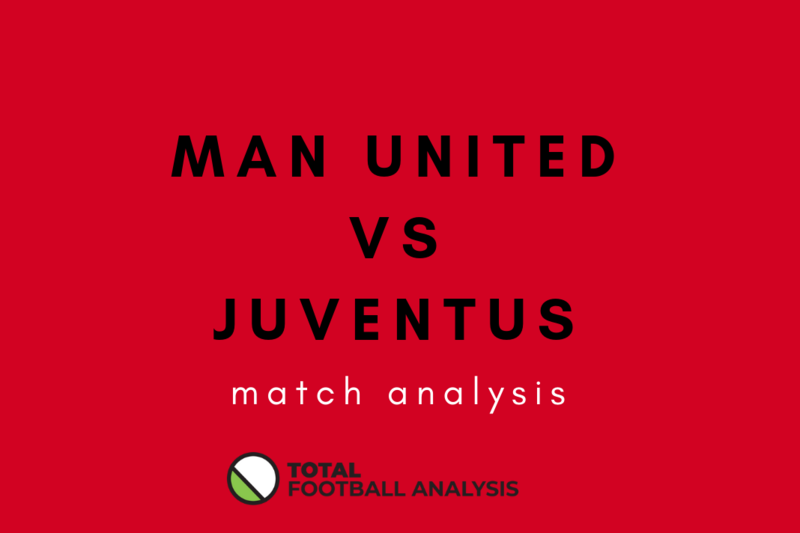 How perfectly structured Juventus beat United at the Theatre of Dreams? It was a special Tuesday evening for Cristiano Ronaldo and Juventus as they completely outplayed his ex-team Manchester United in the Champions League. It was even more special because Ronaldo played his part in the win, assisting Paulo Dybala for what turned to be the winning goal of the night. Great defending and communication between the lines was the reason for Juventus’ win. But Leonardo Bonucci and Giorgio Chiellini deserve all the credit as neither allowed any action in their own box to be performed and had their teammates’ backs covered. Jose Mourinho’s team had hardly any opportunities in front of Wojciech Szczesny’s goal and the performance looked chaotic and disorganised throughout the game. Both teams definitely could’ve have delivered a more exciting show, but Juventus didn’t feel pressured enough to do so and did enough for the win. Paul Pogba and Nemanja Matic were the only players to pull off quite a solid performance for United, but yet, not solid enough to help the team get at least a point out of the game. Although Matic provided some balance between the lines he often didn’t pay enough attention and allowed the opponent’s players sneak behind him which caused some trouble. But lets take a closer look at the tactical side of the game. The Manchester United players were confused by the positional rotations that Juventus were making and couldn’t respond properly. But despite these rotations and changes, the Bianconeri performed with a great confidence and stability. The team used different formations in and out of possession with some of the players having a completely different role throughout the game. When out of possession the team barely left open spaces that their opponents could exploit. But when in possession, they made sure that the weakest United areas were constantly pressed as the players were trying to get their markers out of position and use the created spaces accurately. For example, Juan Cuadrado was used more as an attacker when in possession with a more of a 4-3-3 formation. But when the team had to defend, he would drop back on the right and be the fourth man in the midfield. Otherwise, Alex Sandro and Joao Cancelo would provide the needed width while Pjanic had a deeper midfield role. 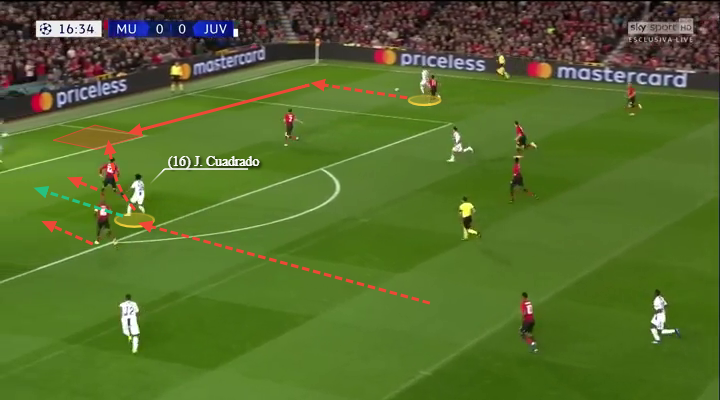 United’s players tried to close the options for Cancelo and made sure that Cuadrado is completely covered as he is dangerous when making speed runs on the flank. Then Cancelo showed great vision and saw Alex Sandro out wide, so he decided to send a long-range pass to him so the team can exploit the free space on the left using speed. Joao had a 100% accuracy of the four long balls that he delivered. The team had 14 chances created compared to only six by United. Nine of these 14 were made inside the box. The Italian side had better pass accuracy percentage too – 89% compared to 81% by Manchester United. They completed more long balls and crosses too. Cuadrado started his off the ball movement once the ball left Ronaldo’s foot. Ashley Young and Chris Smalling tried to close the gap in the central defence and not allow Cuadrado to sneak between the lines but he made an unexpected decision and made a speedy run to the edge of the box to receive the cross. With his movement, he created space which he, later on, tried to use receiving the ball. Usually one of the players who was positioned deep would make a late run into the newly created space. And just for the record – Cuadrado had 92% passing accuracy and made an impressive four key passes. Juventus’ organisation in every area of the pitch was one to be jealous of. They would force the play out wide with extremely focused midfield actions and then the whole team would be responsible for putting some defensive effort. Pogba and Matic were positioned deep in the central midfield with Juan Mata in front of them. Despite their partnership being the most stable out of all, they couldn’t do much as the perfectly structured Juventus’ midfield and defence wouldn’t allow them. Instead, the most active players were Marcus Rashford and Anthony Martial who had to exploit the wide areas. Which they barely did because the support Juve’s back-four received from the midfield helped to bring the lines closer and to close any possible gaps. Mata sometimes dropped in the same line as Pogba to help him cover Pjanic and prevent passes through. That’s when Matic would position himself between the lines to try to pick up Cristiano Ronaldo or Paulo Dybala. But he would often be focused on the ball rather than on the player he’s covering and would leave them to slip behind his back. Exactly what happened when Cancelo made a great through pass to Dybala who managed to reach the box thanks to Matic. In the moments when Pogba tried to offer an off-beat solution, Juventus’ players were forming triangles so they could cover, in this case, Mata and Lukaku. United had a hard time finding any gaps they can use for their attack. 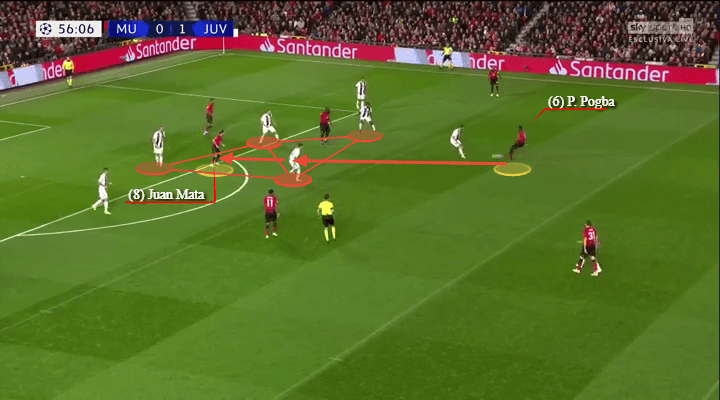 The Red Devils tried man marking every Juventus player but this left a lot of spaces for their opponents to operate in and use their blindside. United’s players were close to Juve’s only by two indicators – successful dribbles (53% compared to 56%) and duels won (45 compared to 48). Next articleAC Milan: How are they playing this season under Gattuso?